The success of the conservation efforts to save the Channel Island fox made the NBC Nightly News on Monday, December 1, 2008 ! How wonderful to see the faces of our friends at Channel Islands National Park talking about the island fox’s rapid progress toward recovery. 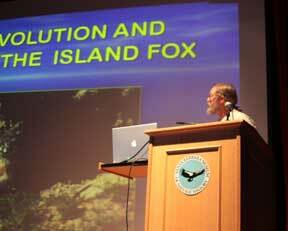 National Park Service fox biologist, Tim Coonan is a familiar face on the Friends of the Island Fox website. 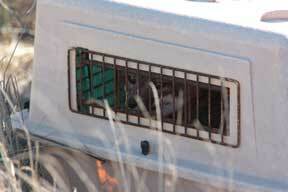 SEE Tim Coonan releasing island fox M-67 back into the wild. LISTEN to an interview with Tim Coonan. 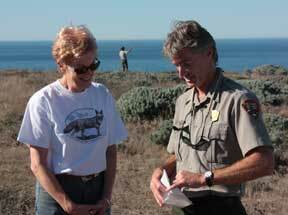 Friends of the Island Fox is proud to have worked with Tim and the dedicated people at Channel Islands National Park. Donations to Friends of the Island Fox have supported this successful conservation effort by funding radio tracking collars and den boxes at the captive breeding facility on Santa Rosa Island. Yes, island fox populations are increasing, but when the NBC reporter said there are 650 island foxes, he was referring to across the three northern islands, San Miguel, Santa Rosa and Santa Cruz. 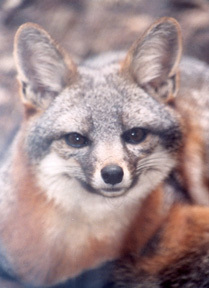 Prior to the decline in the late 1990s, there were over 1,500 island foxes estimated on Santa Rosa Island alone. The two populations on San Miguel and Santa Rosa, which crashed down to just 15 individuals on each island, are still highly vulnerable. The current estimates are just over 100 island foxes on each of these two islands. 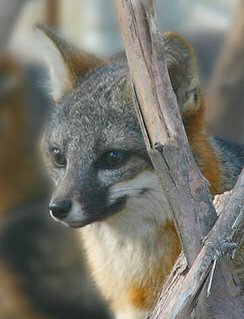 The island fox on San Miguel, Santa Rosa, Santa Cruz and Santa Catalina Island is STILL an endangered species. Monitoring these populations with radio tracking collars is vital to maintaining the continued success of their recovery. Each radio collar costs $250. Funding is still needed to put radio tracking collars on island foxes. Canine diseases, distemper and rabies, continue to pose a serious threat to these small isolated populations. Annual health checks and vaccinations against these diseases still need to be funded. You can help to insure that the island fox continues its historical recovery by donating to Friends of the Island Fox and supporting these continuing important conservation efforts. WATCH the NBC Nightly News report on the island fox. For More Information on the Channel Island fox. Current Island Fox Information. Are you looking for information on the origin of island foxes; how they evolved and their biology? Perhaps you’ve heard people question whether golden eagles were actually preying on island foxes. Answer your questions with information from the primary sources. Friends of the Island Fox is honored to make information available from top researchers and biologists working with the island fox and the Channel Island ecosystem. Paul W. Collins, Curator of Vertebrate Zoology at the Santa Barbara Museum of Natural History recently gave two presentations from his accumulated research at an Island Fox Workshop sponsored by the Santa Barbara Museum, Ty Warner Sea Center, Santa Barbara Zoo and Friends of the Island Fox. Both of these presentations are now available through links from the Friends of the Island Fox Educational Research Library. Diet of Bald and Golden Eagles on the Channel Islands - looks at the role eagles played in the decline of island foxes on the Northern Channel Islands and compares the diet of bald and golden eagles on the islands by examining prey remains in nests. Friday November 7, the remaining able-bodied male island fox in captivity at the captive breeding facility on Santa Rosa Island was released into the wild. This happy day marks an important milestone in the recovery of this endangered species. You can WATCH a moment of history as 6-year-old, M-67 steps out of his transport carrier and into the island scrub of Santa Rosa Island in Channel Islands National Park. LOOK for M-67's radio telemetry collar. The tracking collar was funded by donations to Friends of the Island Fox and will help keep track of this tiny fox as he makes his way in the wild. The door of the travel kennel opened and M- 67 leapt out. But rather than dash off across the lupine studded hillside, he hesitated and looked around. He seemed to know it was a moment to be savored. In the past few weeks, 31 island foxes from the Santa Rosa Island breeding facility have been returned to the wild. Today–November 7, 2008–as Pat Meyer and Friends of the Island Fox, Inc. board members and members of the press looked on, National Park Service biologist Tim Coonan opened the door to freedom for M67. The little 6 year-old male fox was born in the captive breeding facility and over the years had been paired with several females. Now, he sat gazing at the wide open expanse around him. On this momentous day, Friends of the Island Fox proudly presented funds to Channel Islands National Park for two additional fox radio collars. To date, with your support, Friends of the Island Fox has helped put radio tracking collars on 22 island foxes on the northern islands and 10 island foxes on Santa Catalina Island. Radio tracking collars are vital to monitoring the continued success of one of America’s rarest mammals. We will be posting video and a podcast of M67’s release in the next week. May 2007 a wild fire swept over a large area of Santa Catalina Island (Helping Island Foxes In Fire Area). After the fire, a female island fox was found with severe burns on her four paws. Her fur was singed and sooty. Diligent care provided by the Catalina Island Conservancy allowed the little fox to recover and she was released July 11, 2007 wearing a radio collar funded by donations to Friends of the Island Fox. 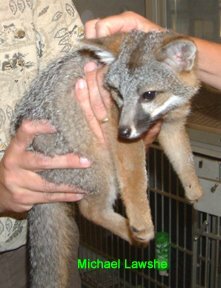 In November of 2007, “Burnie Boots,” as she has been nicknamed, was captured during island-wide fox health checks and she appeared to be doing well. Her feet had recovered fully. The only sign of her previous injury is that two of her toe pads are fused together. This fusing of the tissue happened during the healing process. Boots’ radio collar transmits a specific radio frequency that allows biologists to hone in on her location and check on her movements, even if they can not physically see her. As long as the little fox continues to actively move around, her radio collar transmits a constant signal. If something should happen to Boots and she should stop being active, the radio collar would send out a distinctive distress signal. As July 2008 approached, Boots’ battery-powered collar was in need of replacement. Using the radio collar signal, the Catalina biologists were able to set a trap specifically in the area where Boots was living. They captured her and, as the photo shows, her fur has completely recovered. The biologists replaced Boots' radio collar, checked her health and found a happy surprise. Not only had Boots recovered from last year’s burns, she showed signs of nursing pups. This spring the little fox saved from the fire became a mother. Her pups are helping to increase the Catalina Island fox population. 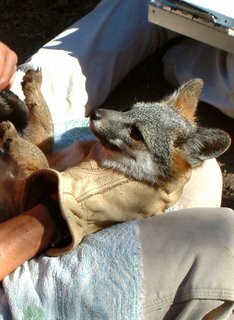 Burnie Boots’ success story is the result of many people working together to help the endangered island fox. The Catalina Island Conservancy manages the daily needs of this specific subspecies of island fox. 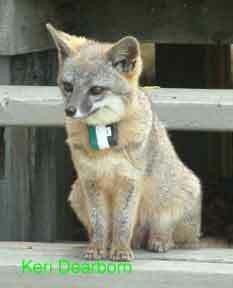 Donations raised through Friends of the Island Fox by students in the Fox Ambassador Program and from concerned private individuals provided Boots with both of her radio collars. Saving this endangered species requires community awareness and involvement. You can make a difference and help save the Channel island fox. Listen to a fox health check in progress. 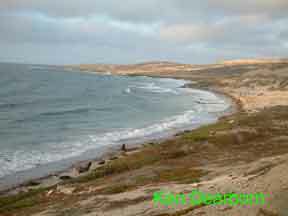 Visiting California’s San Nicolas Island is a unique opportunity. This remote and wind-swept island is owned by the United States Navy. Friends of the Island Fox President, Pat Meyer, and I were fortunate to receive a special invitation for a short visit. Now, in July, the stems are dormant again, but the coreopsis forest is gradually spreading across 10% of the island. 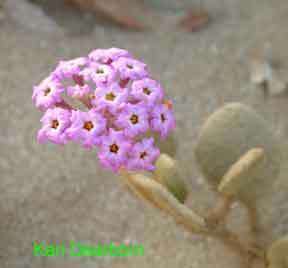 It is a clear sign that native plants are returning. 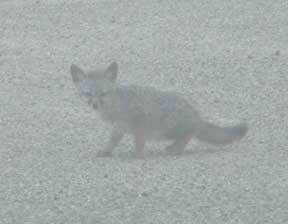 San Nicolas currently has the largest island fox population and the greatest number of foxes per square kilometer. We came hoping to see wild island foxes and the island didn’t disappoint us. We were even lucky enough to see a litter of four pups born this spring. They were about 2 months old and bold little explorers. This is dad with one of the pups in the early morning fog. Dunes and grassland might seem inhospitable to a little fox, but it seems that sand fly larva may be providing an important food source for these foxes. San Nicolas is a unique ecosystem and also home to endangered island night lizards and snowy plover. We saw one snowy plover and a number of other shore birds, including Western gull chicks. 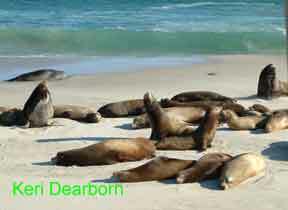 The beaches were busy with breeding California sea lions and resting immature elephant seals. At night, sea lion barks hauntingly drifted up from the beaches. Fog streaked over the dry land. Here and there the wind would tear open a hole to expose the dark black sky with brilliant white stars. What is small, but mighty? Only 3-6 lbs., but willing to stand its ground and protect its territory? An island fox. Catalina Island Conservancy wildlife biologist Calvin Duncan approached a wild fox’s territory, he took this video of an island fox on Santa Catalina Island. 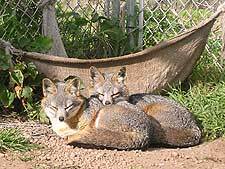 Protecting territory is important for a pair of island foxes. They need a hunting area that will provide enough food to support themselves and their pups. How does an island fox let you know you are in its territory? Watch and see. The fact that island foxes are running wild again on Catalina, Santa Rosa, Santa Cruz, and San Miguel Islands is due to the undaunted efforts of biologists, scientists, government agencies, private conservation organizations and concerned individuals like YOU. When you support island fox conservation efforts YOU HELP to make sure that moments like this will continue into the future. A special thanks to the Catalina Island Conservancy fox biologists Calvin Duncan and Julie King for sharing their experiences in the field with us. 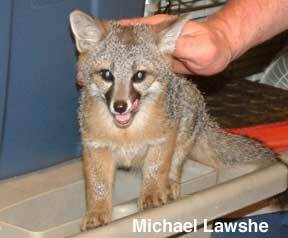 For more on their work with the Catalina island fox: Counting island foxes; Island Fox Health Check. What do island fox pups look like? One of our favorite island foxes just turned 1 year old. Finnigan, or Finn for short, was born last year at the Santa Barbara Zoo. 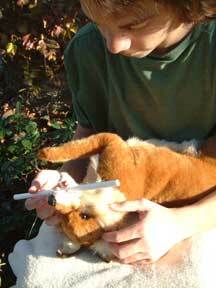 Because his mother is an older fox, she did not nurse him and the Zoo staff had to hand raise him. See Finn's baby picture. Fortunately this little island fox had the perfect personality to become an educational representative for all of his wild cousins. Finn makes guest appearances at special events at the Santa Barbara Zoo. 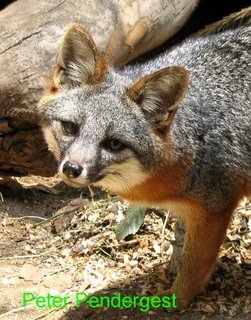 The Santa Barbara Zoo actively participates in island fox conservation and is the home of Finnigan, his parents, and two other island foxes. 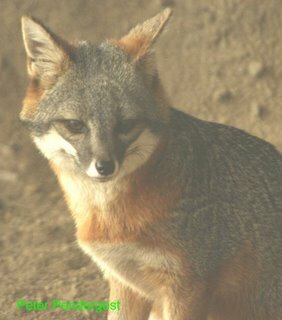 For more information on visiting the Santa Barbara Zoo and seeing the island foxes that live there. Friends of the Island Fox sends our best wishes to a hard working island fox. Happy, Healthy, First Birthday, Finnigan ! 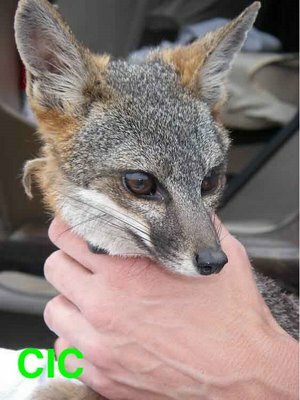 If you have seen the Island Fox San Miguel Island 2006 Release video, you have heard the original music of David Lynch. Complete versions of David Lynch’s music can be found on his CD “Dozen” available through his website. The photo at the top, was taken by Peter Pendergest. Without help from friends like David, Michael and Peter we wouldn’t have a video of the island foxes to show the public or photos to post on our website. Friends of the Island Fox thanks them for their support of island fox conservation and appreciates their efforts to get involved in helping to save the island fox. Are you contemplating romance and Valentine’s Day? So are the island foxes. The cold blustery days from December to February are the perfect season for California’s Channel Island foxes to pair up and settle down in a cozy den. Island foxes make their dens in a sheltered location, sometimes underground, in a tree stump or in amongst dense undergrowth. The male and female establish a territory around their den site and settle down to finding food for a family. 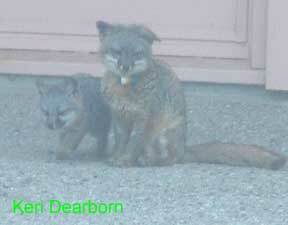 A few island foxes born last spring, will also be out looking for a mate. Even though they are less than a year old, some will become parents this spring. Because population numbers are still far below normal on San Miguel, Santa Rosa, Santa Cruz and Santa Catalina Islands, island foxes are breeding younger and having more offspring than they usually would. The abundance of island deer mice and other food items makes it possible for a pair of island foxes to raise five pups instead of the typical two or three. Valentine’s Day 2008 will be very special on San Miguel and Santa Cruz Islands. For the first time since emergency captive breeding began in 2000, ALL of the island foxes on these two islands are once again free-roaming and choosing their own mates. 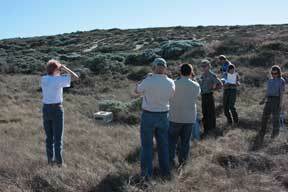 (2007 fox release on San Miguel Island) (2007 fox release on Santa Cruz Island). Captive breeding programs saved the island foxes from extinction on both of these islands, but human matchmakers are never as good as the foxes themselves. We can all hope that this year there will be an increased number of island fox pups born on San Miguel and Santa Cruz Islands. Pups born in the spring and foxes slated for release from the captive breeding facility on Santa Rosa Island will soon be needing there own radio tracking collars. Your donation to Friends of the Island Fox helps to provide radio tracking collars vital to monitoring the recovery of endangered island foxes. You can donate through the PayPal and Cause for Good buttons in the upper right . This Valentine’s Day give a truly romantic gift. Working together we can SAVE the island fox. The islands along California’s coast present a unique collection of habitats with various wildlife and human problems and successes. Island foxes live on six of these islands: Six Islands, Six Different Foxes. Where can you find the most current information from the experts working in the field? This gathering will bring together experts in archeology, anthropology, cultural resources, human history, population biology, ecological processes and systems, systematics, geology, paleontology, oceanography, and climatology. The Symposium is a forum for the presentation of natural and cultural resource information collected on all of the California Islands - the Channel Islands, the Farallones, and the Baja Mexican islands - and their surrounding marine environments.